This custom-made desk set celebrates life's journeys with a map of your choice location. It takes hard work and a clear vision to make your place in this world, and this custom-made desk set celebrates both the journey and the destination. Sealed into its base is a custom map highlighting your choice of location: corporate headquarters, the site of a legendary achievement, a reminder of where you come from, or any other meaningful place. 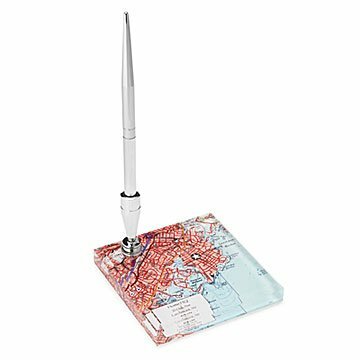 Paired with a sophisticated chrome pen holder, it makes work a little easier while reminding you of your big picture goals and accomplishments. Made in Rhode Island. Love the quality and end product. Was better than expected and a reasonable price. I would recommend the product and the seller, as it arrive earlier than expected. These were bought for clients. They loved the gift and were super happy with it. I was disappointed that the map was not crisper - I felt like the print quality was only fair. That being said it is still an attractive piece but I don't know if I would reorder. What a unique graduation present! Such a unique and personal gift! Love how this looks!